Quinoa isn’t just for savory dishes. 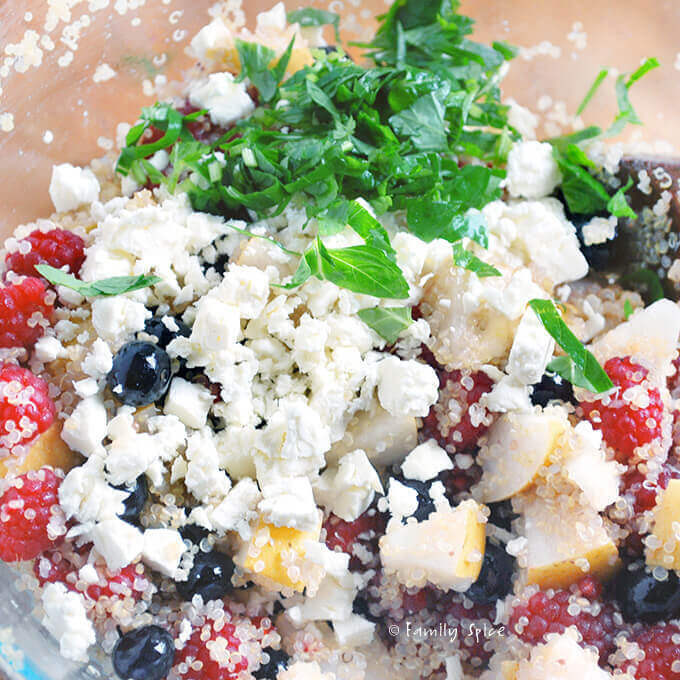 You can also mix it with fresh fruit and a tangy dressing to make this delicious Quinoa Fruit Salad with Feta. School starts today for my kiddos! Where did the summer go? You spend the last weeks of summer rushing with back-to-school shopping and back-to-school pool parties. We sneaked a few more beach visits since our San Diego summer was a bit cold at the beach. And true to San Diego style, the weather warms up when the kids return to school. Really??? Maybe our school district needs to make August & September our summer vacations so we could thoroughly enjoy our warm weather. With the first day of school here, there is so much to do today! Which begs the question, why am I on this blog??? 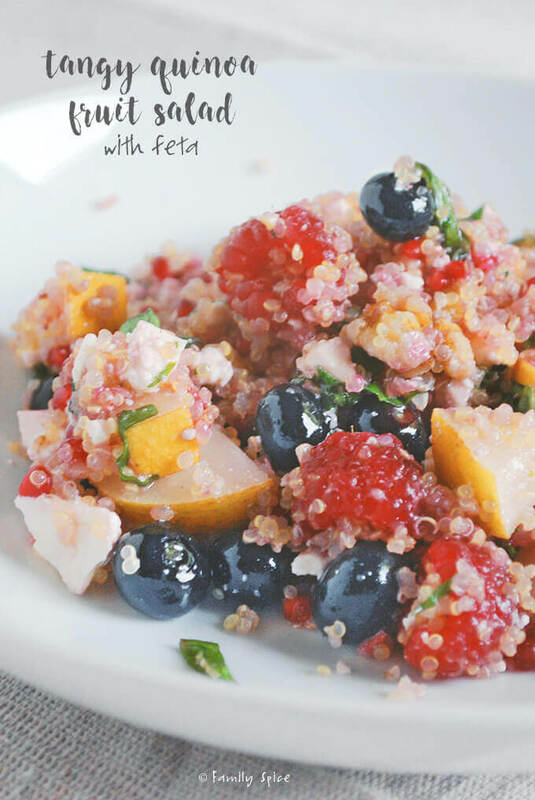 Well, I got up especially early this morning to browse other great blogs and to share with you another fabulous quinoa salad. Quinoa isn’t just for vegetables. You can also mix it with fruit. And this fruit salad is a bit untraditional, a Tangy Quinoa Fruit Salad made with a tangy raspberry vinaigrette. I developed this for Newman’s Own using their raspberry vinaigrette, but you could easily make your own. I combined cooked & cooled quinoa with chopped Asian pears, blueberries, raspberries, walnuts & feta cheese. Some fresh mint for added color and fragrance and I was done. This was something special! I had over a dozen friends sample the salad, as I knew adding a vinaigrette to a fruit salad was a little daring. Most everyone loved it and wanted more than the small 1/4-cup sample I gave them! I say most everyone, since the hubby did not. Oh well. He was in the minority. And, he doesn’t like feta in his salad! But, you will love the salad. Very refreshing. And well, very tangy & delicious! Now, I have three lunch boxes to pack up! 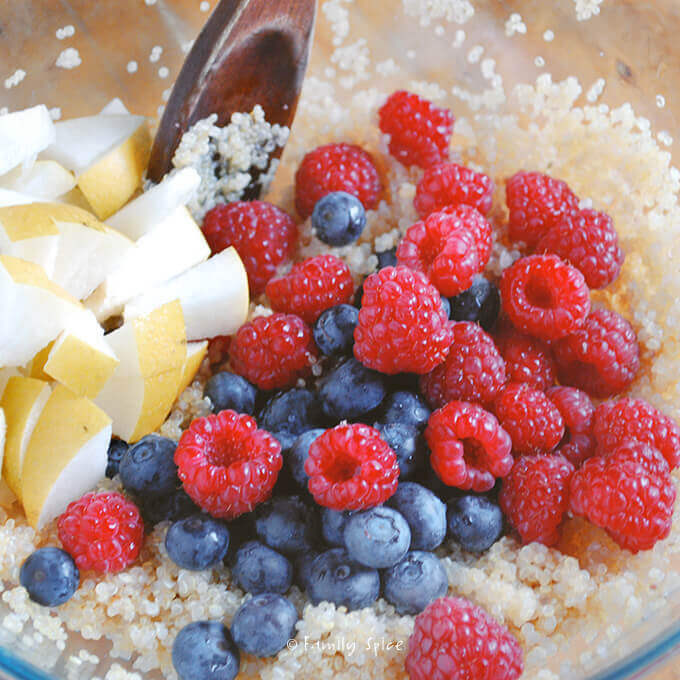 Add cooled quinoa to raspberry vinaigrette & mix together. Serving Suggestions: Great for picnics, too! Cooking Tips: Also great with grapes, strawberries and blackberries. I have been on such a quinoa kick lately. This salad is right up my alley! Thanks for sharing! Yum! This looks great. I love quinoa! Looks delicious! My kids don't go back to school until Monday though. I live in San Diego too. Cloudy at my house right now, but I'll definitely take this summer over last!